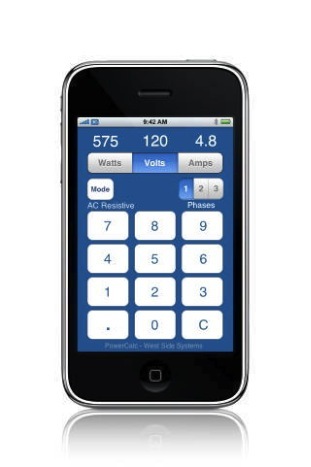 PowerCalc calculates electrical power loads. How much power do I need for these lights? How much wattage can this 12 volt supply handle? How much wattage can this multi-phase service handle? Enter a wattage to determine the electrical current in amps. Or enter rated ampacity of a device and see maximum wattage load. Works for any voltage. In resistive mode, select two or three phase service to see amps per leg and total wattage for a multiphase power distribution. AC Inductive mode allows setting of power factor and selection of single phase or three phase motor power calculations.